Yilport Holding A.S., a subsidiary of Yildirim Group, has signed a letter of intent (LOI) with the Mississippi State Port Authority to allow for due diligence and negotiations regarding the potential location of Yilport at Gulfport, USA., which will become Yilport’s first terminal investment in North America. 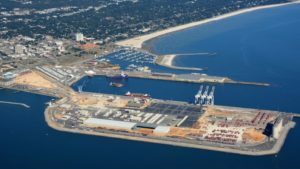 Strategically located on the northern Gulf of Mexico, just 18 miles from the open Gulf waters, with good road and rail connection (rail service is provided by Kansas City Southern Railway Company), the Port of Gulfport is offering access to 75% of the US market. Encompassing 300 acres (120 hectares), the port has nearly 6,000 ft (1,828m) of berthing space across 10 vessel berths with a 36 ft (11m) draft, equipped with two 100-ton capacity mobile harbor cranes and three STS cranes. The port is currently completing the USD 570 mln restoration project, which involves its rehabilitation after Hurricane Katrina in 2005 as well as the expansion. In November 2017, the Army Corps of Engineers released the Record of Decision for the Port of Gulfport Expansion Project, which paves the way for a 282-acre dredge and fill program for further expansion of the port’s operations. With the permit in-hand, the port is now evaluating options to complete the dredging project. Yilport Holding intends to bring its know-how, expertise in multi-purpose port operations and state-of-the-art port technologies at Gulfport in order to improve terminal productivity and services and make the port the most competitive in the region. Signing the LOI, the Group commits to investing in additional facility and equipment upgrades. The deal confirms the Group’s strategy to grow through mergers and acquisitions to become one of the world’s top 10 leading container terminal operators by 2025. In late 2015, Yilport Holdings already made a bid for Ports America, the largest terminal operator and stevedore in the US, and currently is seeking a financial investor to join that bid.